The G7 is a group of 7 largest economies of the world. The respective leaders of the G7 countries assemble together annually to discuss various issues like international economy, monetary issues etc. at various G7 summits. In this article we will have a brief look on this issue. G7 countries represent more than 62% of the global net wealth ($280 trillion). G7 countries represent more than 46% of the global gross domestic product (GDP) based on nominal values, and more than 32% of the global GDP based on purchasing power parity. Also, the presidents of the European Council and the European Commission represent the EU at G-7 summits. Including the EU the G7 represents over 70% of the global net wealth. Even though China is the third largest economy in the world with around 10% of the total wealth of the world, it is not included in the G7 because it is still considered to be a developing country because of its low net wealth per adult. In 1998, Russia joined G7 making it the G8, but it was kicked out in 2014 after its annexation of Crimea. In 1975, France hosted a summit which brought together representatives of six governments: France, West Germany, Italy, Japan, UK and USA. This came to be known as G6. In 1976, Canada was invited to join the group as an English speaker with a lot of experience was needed and Pierre Trudeau, the then Prime Minister of Canada was perfect for this role. In 1977, UK invited the European Union and since then the president of the European Commission, and the leader of the country that holds the presidency of the Council of the European Union represents the EU in each of the summits. Until the 1985, no one outside a tight official circle knew when the seven finance ministers met and what they agreed upon. The summit was announced the day before and an official press statement was issued afterwards. The G7 was found to discuss important issues related to economics after the collapse of the exchange rate in 1971, during the time of the Nixon shock, the 1970s energy crisis and the ensuing recession. It was held on 8–9 June 2018, in La Malbaie, Quebec, Canada. It is the first G7 summit to be hosted by Quebec since 1981. 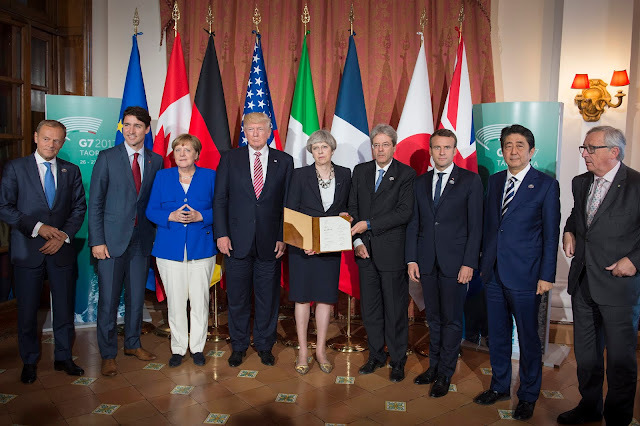 Because of the United States withdrawing from the Joint Comprehensive Plan of Action and from the Paris Agreement, American tariffs, and trade-related disputes between Trump and French President Emmanuel Macron and Canadian Prime Minister Justin Trudeau, this year's Summit was dubbed G6+1 by the media. G7 summits have drawn outrage and protest among activist groups that demonstrate against capitalism, patriarchy and racism. Jim O'Neill, the person credited for coining the term BRIC says that G7 is irrelevant as India and China have been left out. In March 2014 Russia was suspended by G7 members from G8 following the annexation of Crimea. After the suspension Russian Federation decided permanently to leave the G8 in January 2017. It was confirmed in June 2018. In 2015, protests took place in Germany against G7. The protesters questioned the legitimacy of the G7 to make decisions that could affect the whole world. In the recent 2018 G7 Summit, Donald Trump advocated the inclusion of Russia in the group.